Back in the summer of 2011, our friends at Reservoir Geeks reached out for help. 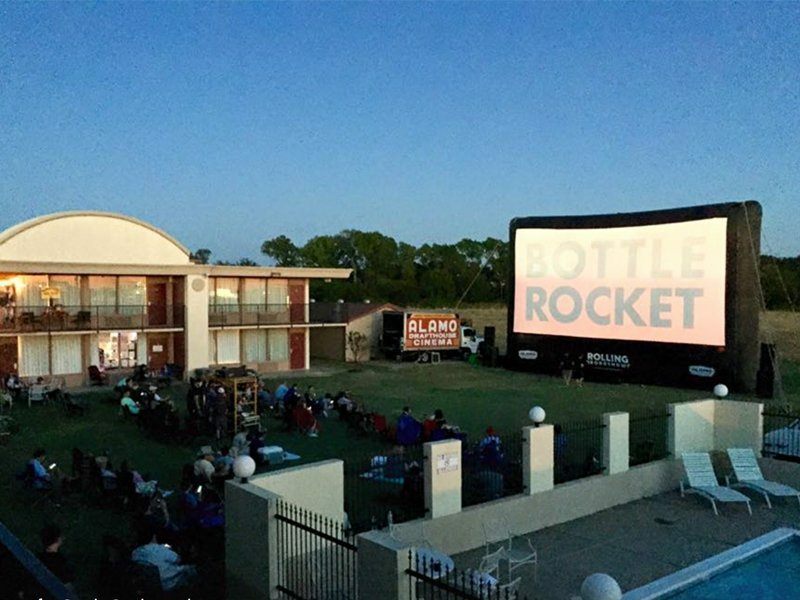 As massive fans of Wes Anderson's debut feature, BOTTLE ROCKET, they had become fond of the iconic motel featured in the movie, the Days Inn in Hillsboro, TX, and they heard that the owners were struggling to stay open. As massive fans ourselves, we knew we couldn't let the motel just shutter forever, and so we partnered with the Reservoir Geeks for the very first Lovely Soiree at the Bottle Rocket Motel event in an effort to raise money and help the motel continue for fans and weary travelers alike. Now, in 2017, the motel is still open, and over the years the Reservoir Geeks have returned for an annual Lovely Soiree that just gets better and better with each passing year - and this year is going to be the best one yet, and a truly special experience for any Wes Anderson fan. Because not only will we be hosting a screening of the film on our massive outdoor screen. Not only will you be able to book a room in the very same motel from the movie, where we'll also be hosting guided tours of filming locations. And yes, we'll be having a pool party before the movie to cool down in the late September Texas heat, but that's not even the most magical part. The most magical part of the evening starts to come on after the screening, when we've been transported to another world and we're ready for more, when we all go back to our rooms, put on the finishing touches of some decorations, and open the doors to several differently themed party rooms celebrating the complete Wes Anderson catalog. These rooms are all created by you, the fans, and the fans have made it a habit of going all out to really entertain themselves, and each other. As a result, the Lovely Soiree is more than just a screening of a beloved film at an iconic location - it's a gathering of a community, and it's continuing the tradition started in the movie of meeting new people and making incredible new friends. You can pick up your ticket to attend the Lovely Soiree by getting $15 tickets on this page. If you'd like to book a room at the motel, you can call the Days Inn directly at 254-582-3493 to book a room for that night. And to sign up for a themed party room, get in touch with the Geeks directly on their Facebook page. Fox Searchlight’s acclaimed stop-motion animated hit returns to theaters for one day only featuring an exclusive conversation with director Wes Anderson and co-star Bob Balaban. And a somewhat problematic way of conveying that sentiment.